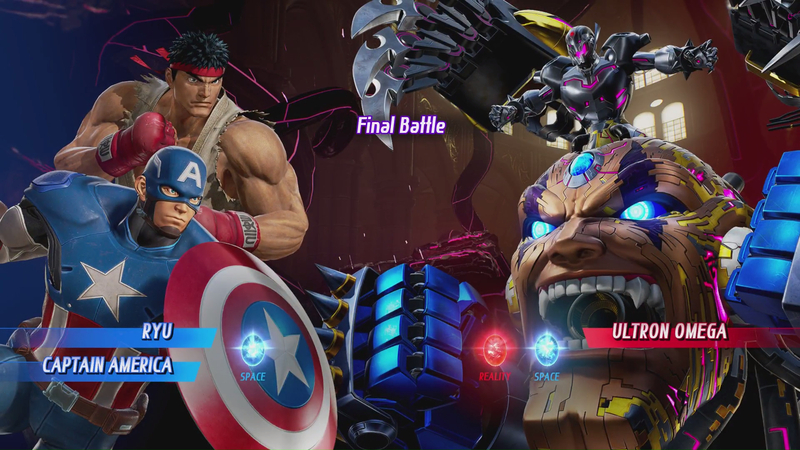 Ultron Sigma has one final form at the end of Arcade Mode and Story Mode. Shacknews has a few pointers for taking on Ultron Omega, the villains' final form. One would imagine that Ultron Sigma is a daunting challenge on his own. He's a fusion of two of the baddest villains in the Marvel and Capcom universes. But it wouldn't be one of Capcom's crossovers if there wasn't a final boss that took up half the screen, would it? So prepare yourselves, Marvel vs. Capcom: Infinite players, to take on Ultron Omega. Ultron Omega is tough as nails, but he's entirely beatable in both the Story Mode and Arcade Mode. First, let's look at the confrontation in Story Mode, which is a two-parter. The first fight against Ultron Omega will see you control Thor and X. This fight can be trouble, because it's on a timer. Dante is hanging in the background and if his health falls to zero, the fight is lost. Fortunately, you won't have to knock Ultron Omega's health down all the way to win this portion of the battle. Once his health reaches 75%, this portion of the fight will end. Go for the Ultron body along Ultron Omega's upper-half, using combos and Thor's Mighty Tornado Hyper Combo. Ultron Omega will defend himself with powerful melee blows, a metal shuriken that travels across the upper-half of the screen, and a powerful scream that keeps you at a distance. Ultron Omega has Hyper Combos, too! He has a Level 1 hyper beam, powered by the Space Stone, which hits similarly to Ryu's Shinku-Hadouken, but with greater range. His other Level 1 will see him reach out and clap at you. If he makes contact, he'll suspend you in mid-air and strike with all four of his disembodied hands and drill you into the ground for massive damage. The second phase of the final boss battle will see Captain Marvel and Dante look to finish the job. Strike quickly, making sure to watch out for Ultron Omega's heavy melee strikes and eye beams. He'll go into a defensive position when it's time to move to the next part of the battle. After he puts up his dukes, Ultron Omega will head into the background and call in two Ultron Drones to attack simultaneously. Dispatch the drones, making sure to avoid Ultron Omega's overhead lasers. The battle will resume with Ultron Omega, so continue the previous strategy of aiming for the upper half of his body, while blocking his strikes and projectiles. He'll soon block again, at which point he'll call in another Ultron Drone. Give that piece of scrap the same treatment and wipe it out. In addition to his powerful melee and overhead attacks, Ultron Omega has his Infinity Stones at his disposal. He will fire off the Reality Stone in triple bursts and they'll home in on you. The Space Stone is a traveling vortex that will travel horizontally across the screen. They're blockable, but they move slowly and Ultron Omega won't stop his onslaught, so be careful. He'll also have Infinity Surges available to him, so be ready to face the Space Stone or Reality Stone powers. 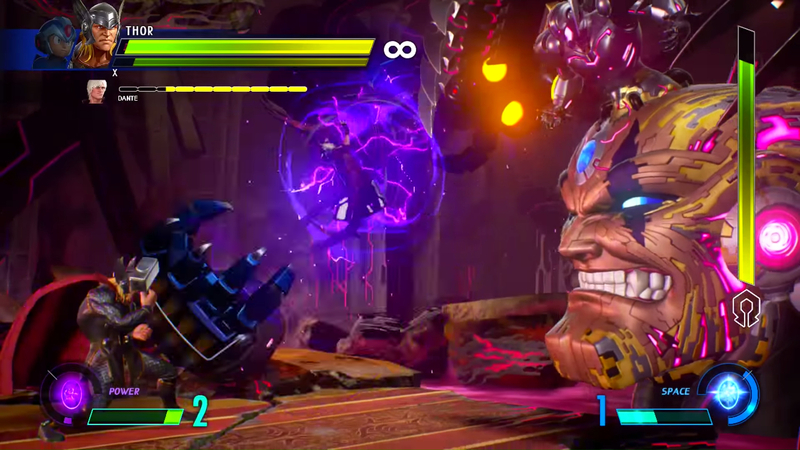 You will also have Infinity Stones available to you and in Story Mode, you'll be able to switch between any of the four Stones at will with the right analog stick. Keep it on the Soul Stone, because you'll likely need its life-siphoning ability and the resurrecting Infinity Surge. Don't waste that Infinity meter, because it may turn out to be a life saver. Keep using Captain Marvel and Dante's Level 1 Hyper Combos when openings present themselves and stick with the Soul Stone to keep your life refreshed. Ultron Omega isn't an easy fight, but he's entirely beatable. Arcade Mode offers some more flexibility, since you can bring in whichever two characters and whichever Infinity Stone you desire. Approach Ultron Omega at the start of the fight and don't waste any time going straight for the face. Ultron Omega will often open the fight by lunging with a right hand, but it won't reach you if you're in his face. Pound away, but be wary of an overhead anti-air or a straight screen-wide lunge that will likely follow. Just as with the Story Mode fight, the idea is to focus as many attacks on Ultron as possible. Deliver enough punishment to the Ultron body and the whole boss will stagger, putting him in his defensive block position. Hammer away and charge your meter as much as possible. Next comes an Ultron Drone. Try and stay on the left side, so you can also watch out for Ultron Omega's incoming attacks. Once the drone is dispatched, focus again on Ultron's upper half, making sure to watch out for the Infinity Stones and for his fully-charged Hyper Combos. After Ultron Omega goes into his defensive position for the second time, he'll send out two Ultron Drones. These are tricky pests, who will try and sandwich your character. That creates all sorts of problems, so keep trying to roll to the left. Ultron Omega won't help matters by shooting out overhead lasers that crumple your character on contact. Repeat your assaults and keep aiming at Ultron Omega's head. As the fight goes on, he'll activate Infinity Surge, so get ready to stay on the offensive. The Space Stone Infinity Surge is particularly troublesome, since it'll restrict your movement, so block as much as possible. Like Story Mode, the best Infinity Stone for this fight will be the Soul Stone. When an opening presents itself (preferably if a partner has been KO'd), use the Soul Stone's Infinity Surge and let fly with Hyper Combos. Be persistent, play a defensive game, keep building that meter and Ultron Omega can be defeated.